There is a footnote in Heresies Exposed: "Mr. John Long has written us that he was the man who obtained for William Irvine 'the first opening for a mission in Nenagh, August, 1897.' That 'William Irvine is the name of the original leader of the Go-Preachers. Irvine Weir was one of the first staff of preachers who emigrated to America; these two names seem to have got mixed up.' He declares that the movement dates from 1897." It appears that John Long's footnote was first added in the 8th edition of Heresies Exposed (1935). 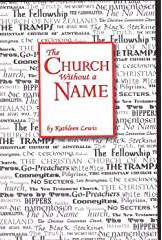 The EDITOR speculates the comment regarding the mix-up of names has reference to the name given in the first paragraph: William Weir Irvine. Wm. Irvine was not given a middle name on his birth registry. 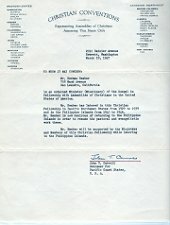 No document known to the Editor (other than this article) ever calls him Wm. Weir Irvine.
. THE COONEYITES OR "GO-PREACHERS" AND THEIR DOCTRINES . The originator of this cult was a Mr. William Weir Irvine, a Scotsman, who went to Ireland many years ago as a preacher in connection with the Faith Mission. He subsequently left them, and started an independent Mission on his own lines at a town called Nenagh, Co. Tipperary, where he found a few hearty people who had been but recently converted. These he succeeded in gathering around himself and they became the nucleus of his sect. He commenced by holding missions in school houses and Methodist churches, which had in good faith been placed at his disposal; and in course of time, a number of young men and women professed conversion to his views and followed him from place to place. . The condition of church life in the south of Ireland at that time was such that there were young Christians who were languishing for lack of spiritual food, and were grieving over the want of ardour in the Gospel among them. Such were attracted to these preachings and mistook the vigorous denunciations and excitable preaching of the missioner for spiritual power and holy zeal. Ultimately, many of them were induced to unite with him. Irvine then commenced a virulant attack on Methodists and Methodism, and publicly anathematized all churches, and their ministers. This led to the withdrawal of all permission to use any of their property for his meetings. It was about this time that Edward Cooney gave up his secular employment and threw in his lot with Irvine, and became what he termed a "Tramp-Preacher," hence came the new name, "Cooneyites," or "Tramp-preachers," as they are sometimes called. They are called "Go-Preachers" in that they go out two by two, without money, purse, or scrip, and literally tramp from place to place, claiming to obey the word of Christ to His disciples in Matthew 10:7, "As ye go, preach," hence the name "Go-Preachers." Further developments shortly took place. If any of them had any money they were exhorted to give it up, and literally carry out the teachings of the Lord Jesus in Luke 9:1-5, and Matthew 10:5-42, and this they called the "Jesus Way." Any form of outward respectability in dress was pronounced worldly, and contrary to "The Jesus Way," for He lived and worked as a poor Man. Only those who follow the "Jesus Way" are regarded by them as Christians, and every profession of conversion through other instrumentality than their own is regarded as Satanic, and their work that of "False Prophets" and "Hirelings." Conversion to "The Jesus Way" or "The Lowly Way," as it is variously called, is according to them, indispensable for salvation, and this can only be evidenced by their following it; and any divergence of thought from this teaching is denounced as "Earthly, sensual, and devilish." . They usually move about in couples, composed of young men or young women. They seem to be very shy of large cities and towns, preferring the country districts, where they seem to gain easier access to souls, and find less opposition to the propagation of their pretentious dogmas and doctrines, which damage spiritually all who lend an ear to them. Their first practice is to visit some place and seek out those that are "worthy," as they deem it; which in reality means, those who are prepared to listen to them, and receive them. They state they have come to preach the gospel in the real "Jesus Way," and that they belong to no sect. If they are refused, they will browbeat, insult and endeavour to frighten the timid, and end by literally "shaking off the dust of their shoes against them." If they are received, they very soon bewilder their host with their perverted and plausible application of Scripture, and alas! sometimes eventually gain their adherence, unless they are well grounded in the Gospel, and possessed of a well-balanced mind. For the sake of securing one proselyte they have been known to preach every night for two or three months. Their method of making converts is as follows. At the close of their preaching, an appeal is made to any who realize that they are not right, that they should turn to the Lord in true repentance, and signify the same by raising their hand. Those who do so are counted as born again, or as having turned from "the wrong way" to the "Jesus Way" or "The Testimony of Jesus," as it is variously styled. They boldly state that there are no true servants of Christ in any of the churches, and that there are no true Christians except those who are converted in their meetings. They claim that they only are the true servants of Christ, inasmuch as they only have complied with the Lord’s command to sell all they have and preach the gospel without money and without price. Their converts must be baptized by immersion, and, when as is sometimes the case, parents are opposed to their teaching and methods, their children have been known to forsake parents and home and all filial obligations, under the baneful influence of these preachers. "One of the first results of their lowly-way doctrines" (?) — writes a correspondent — "is the loss of natural affection. I saw it in others, and I have found it in my own experience." We quote from a letter written by one who has recently escaped from the snare, but whose husband is still a strong adherent of the sect. "You teach that your communion must be confined to those of ‘The Jesus Way,’ and with them alone, and thereby with Jesus Christ and His apostles and prophets. Any other communion you hold to be of the devil and not of God. Consequently, if any one of a Christian household should become attached to your sect, be they husband or wife, brother or sister, they may not again kneel in prayer, sing hymns, or read the Scriptures together." This little bit of evidence goes far to corroborate all that we have ever heard of this sect on these points. Their aim is to establish churches in every place where they are received. These are presided over by "bishops," — men who have strictly conformed to their tenets. They maintain that the only way to worship God is that the meeting must be held in the house of some "saint," for every other kind of religious meeting is "the false way." They meet together privately every Sunday (generally in the house of a "bishop") and "break bread," as was the custom of the early church. They hold prayer meetings during the week, and in all these gatherings both men and women take part. They urge a strict attendance at all these meetings, and nothing but extreme sickness must be allowed to keep them away. Their ordinary converts are allowed to pursue their secular calling, but must strictly adhere to their regulations. If they find any one with means who is likely to be of use to their cause, they exhort them to sell all that they have and to "Go Preach." There is a well authenticated case of a local preacher in England who, after arguing with some of these preachers, broke up his home and went off with them, he in one direction, and his young wife, with one of their women preachers, in another. Another case recently brought to our notice, in Australia, is that of a young man possessed of property. He was attracted by their preaching and wished to join them in their work; but they refused to anoint him and lay hands on him for the gift of the Holy Spirit, because he was not prepared to sign all his property over to them. This opened his eyes. A "saint" may have his own settled home, but they deem it to be wholly wrong for a "true preacher" to have a settled home and family. They discourage marriage, and in a subtle way forbid the marriage of their preachers. Originally, those who were married before they were received among them generally separated. The children were given up and the husband and wife were sent out apart, with the other preachers. We now learn that this has been recently somewhat modified. The husband and wife are now allowed to go together. In justification of this they quote, wrest, and grossly misapply the words of the Lord Jesus Christ, "Who is My mother? and who are My brethren? ...For whosoever shall do the will of My Father which is in heaven, the same is My brother, and sister, and mother (Matt. 12:48-50). This treatment of the marriage bond is not only unscriptural, but it has often led to the grossest form of evil. We need hardly say that many of the things above referred to, which are now being reproduced in this new cult, are some of the ugliest features of Rome. They make the loud boast that when once a person really received "the truth" from their preacher’s lips, they never give it up, nor have they had any occasion to excommunicate any real "saint." However, there are many today preaching with other bodies of Christians who used to preach with them. But these are denounced and accounted as "apostates," for whom there is absolutely no hope! They cannot be renewed to repentance, and can only await "a certain fearful looking for of judgment and fiery indignation, which shall devour the adversaries" (Heb. 10:27). . Arrogant assumption, coupled with a loose way of handling the Scriptures, seems to be the prevailing feature of this pretentious sect, and the wonder grows that any can be found to give heed to their lofty claims to a superior spiritual elevation, and to a special and divine appointment to their mission. They are not missionaries in the strict sense of the word, for their zeal has never yet carried them to the unevangelized heathen. Yet, judging from the statements made from time to time by these preachers, we might conclude that God has had no true witnesses on earth since the time of the Apostles until the advent of the Cooneyites. All that ever came before them they unhesitatingly stigmatize as false prophets and hirelings, and their work "earthly, sensual, and devilish." What can we say to the colossal conceit and effrontery of men who will publicly and unblushingly assert that such God-honoured servants of Christ, as Luther, Wesley, Whitfield, Spurgeon and Moody, and the like, whose memory we all revere, were simply and only Hirelings and Impostors, and are all now in hell!! This they are constantly affirming, and that because they did not preach the gospel in the "True Jesus Way." We may now enquire what is this preaching of "The True Jesus Way," of which the Cooneyites claim to hold the monopoly, and without which (and a Cooneyite to preach it) no one can be saved. When they are asked, all they seem able to tell us is that the "True Jesus Way" is laid down in Matthew 10 and Luke 9 and 10. From these Scriptures they constantly quote, laying particular emphasis on "Go preach" and "provide neither gold, nor silver, nor brass in your purses, nor scrip for your journey," etc. Read for yourself the commission which they allege they carry out and which we will here quote at length, and see if you think they have ever fulfilled it or were ever even sent to do so. "These twelve Jesus sent forth, and commanded them saying, Go not into the way of the Gentiles, and into any city of the Samaritans enter ye not; but go rather to the lost sheep of the house of Israel. And as ye go, preach, saying, The Kingdom of heaven is at hand. Heal the sick, cleanse the lepers, raise the dead, cast out devils; freely ye have received, freely give. Provide neither gold, nor silver, nor brass in your purses, nor scrip for your journey, neither two coats, neither shoes nor yet staves: for the workman is worthy of his meat. And into whatsoever city or town ye shall enter, enquire who in it is worthy: and there abide till ye go thence. And when ye come into an house, salute it. And if the house be worthy, let your peace come upon it: but if it be not worthy let your peace return to you. And whosoever shall not receive you, nor hear your words, when ye depart out of that house or city, shake off the dust of your feet" (Matthew 10:5-14). Read also Luke 9 and 10. Note the special messengers appointed to fulfill this mission, the particular object of that commission, and how completely it was carried out at that time. First: That commission was given to the twelve apostles by name. These were afterwards followed by seventy others, all directly sent by the Lord. Where are the Cooneyites in this? Second: Their sphere of service was distinctly limited to the cities "Whither He Himself would come" (Luke 10:1), and they were not to go into the way of the Gentiles, nor into any cities of the Samaritans, but only to the lost sheep of the house of Israel. Is this the sphere to which the Go-preachers limit themselves, think you? Third: The special time and object of that mission was after the death of John the Baptist and in view of Christ presenting Himself to that nation as their King in fulfilment of the prophecy of Zechariah, "Behold, thy King cometh," etc. (chap. 9:9). The object of their mission was to announce that the Kingdom of Heaven was at hand, and their credentials that they had been sent by the King Himself were witnessed in the fact that they had power given to them by which they could cast out devils, heal the sick, and cleanse the lepers. Do the Cooneyites answer in one single particular to the special features of this special mission? We unhesitatingly deny that they do. Then whether it is right for them to claim this to be their special mission and then distinctly to disobey the Lord’s specific injunctions as to their sphere of service, and to exhibit none of the credentials of those sent out on that mission, we will leave it to the reader to judge. We affirm that there is no continuation of that mission today, being, as it was, specific in its sphere, time, and object, and for the simple reason that it was fulfilled by those to whom it was given. Nothing could be in greater contrast than the commission we have been considering and the one given in Matthew 28:19, and Mark 16:15, "Go ye into all the world," etc. Nothing is said in this commission about no money scrip, or purse, which the Cooneyites accentuate as being one of the chief features of "The Jesus Way." On the night of our Lord’s betrayal, He reminded His disciples of the mission upon which He had previously sent them. "When I sent you without purse," etc., now He says, "He that hath a purse let him take it, and likewise his scrip" (See Luke 22:35,36). In the face of that, would these Go-Preachers say that this was not "the Jesus Way"? To confound these two missions or to say that one is the continuation of the other, is to proclaim a lamentable, indeed, culpable ignorance of Scripture and its teachings. . It is very difficult for anyone not initiated into their sect to get an official outline of their doctrines, for they purposely refrain from printing books or tracts for public circulation. There is an undoubted object in this practice. We have been given to understand that latterly something has been printed which only those amongst themselves are allowed to see. They are likewise careful to ban all other books and tracts, for they declare that no one can benefit from the reading of such literature. They even go so far as to declare that the Bible is a "Dead Book" unless it is "made to live" through the mouth of one of their preachers. This again savours of the pretensions of Rome. 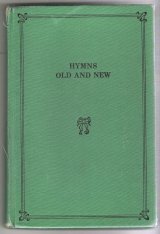 But even here they are strangely inconsistent, for we have before us a collection of hymns printed specially for their use, but it is mainly compiled from the popular evangelical hymn books in general use, though incorporated with them are some of their own productions, which are singularly conspicuous both by their particular phraseology and what they lack on account of their teaching. Having, therefore, no original writings nor published statement of their doctrines, we can only deal with matters that have been fully authenticated and we may say, are being constantly verified by reliable witnesses from various parts of the world, whose testimony is consistent and unimpeachable. These witnesses are either those who have escaped the snare, or who have heard these things for themselves. WHAT THINK YE OF CHRIST? . The Go-Preachers profess to believe in the deity of Christ, but utterances such as this, "Jesus overcame His own flesh," clearly show they believe that the Lord Jesus Christ had sinful flesh in Him that needed to be overcome! How incompatible this is with Luke 1:35: "That holy thing that shall be born of thee shall be called the Son of God," and "In Him is no sin" (1 John 3:5). No one that believed Him to be God the Son, could speak of His "having to overcome the flesh in Him." Having, therefore, false thoughts of Christ we shall be prepared to find they have false thoughts of His work, for these two things always go together. . THE ATONING WORK OF CHRIST . "The Jesus Way" of the Cooneyites, accordingly, has no room for the precious atoning blood of Christ as the ground of salvation. One of them remarked the other day to a friend of the writer, who was pressing the necessity of the precious blood of Christ as the ground of salvation, "How can the blood of a dead man save anyone?" Underlying that question is an assault upon both the deity and the atoning work of Christ. A correspondent writes, "Of all the time I was with them, I only once recollect one of their preachers mentioning the blood." They assert the work of Christ is not finished, and that in the face of John 17:4, when He said, "I have finished the work which Thou gavest Me to do:" and also of that memorable peace-giving and victorious cry of the dying Saviour on the cross — "It is finished" (John 19:30). In support of this strange contention they quote, and again wholly misapply Acts 1:1, "Of all that Jesus began both to do and teach." The Cooneyites thus claim to be carrying on the work of Christ which He only began but did not finish. They have even gone the length of blasphemously pronouncing one of their preachers to be "Jesus Christ come in flesh!" They ignore also the sovereign work of the Holy Spirit in the souls of men. While they admit the term, "New birth," and prefer the term "regeneration" to "conversion," yet with them it is simply "turning from the wrong way" to "the Jesus Way." They claim there cannot be new birth without human agency, and that, in their opinion, means a Cooneyite preacher. Quoting from an "Open Letter" to the Cooneyites, it says, "You deny the atonement made by our Lord Jesus Christ on Calvary’s Cross. This is the foundation of all our blessing (Romans 2:25; Ephesians 1:7; Colossians 1:14). Your denial of this classes you with every anti-christian sect . . . Everywhere in Scripture we are shown that the blessing flows to us through the death and blood-shedding of Christ, which you deny. I know that you teach that we are saved by the life of Christ, quoting Rom. 5:10, ‘We shall be saved by his life,’ but no thoughtful intelligent reader of Scripture could take that clause to mean Christ’s life on earth before His cross. Romans 5:6,8,9, speaks of the sinful and ungodly being justified by His death, and how can you get the last clause of verse 10 to refer to His life before His death, without putting the whole teaching of the apostle out of harmony? The devil does not mind what else you preach so long as you deny the efficacy of His atoning work at Calvary." This is important testimony from one who has just come from the bosom of that sect. A REVIEW AND A WARNING . From the foregoing and well-attested evidence, it is clearly to be seen that Cooneyism neither offers a Saviour nor salvation, but rather goes far to show that neither are needed. If it were necessary for Christ "to overcome His own flesh" as they affirm it was, then His was a sinful condition, and as such, He would need salvation Himself. If again, there is no atoning value in His precious blood, as they teach, then there is for the sinner no possible means of cleansing, justification or redemption — all of which, the Scriptures tell us, are dependent upon, and are received through faith in His blood. (See Romans 3:24, 25; Acts 10: 43; 1 John 1:7). One Scripture alone proves the fallacy of these Cooneyite statements. "Ye were not redeemed with corruptible things, as silver and gold . . . but with the precious blood of Christ, as of a lamb without blemish and without spot" (1 Peter 1:18, 19). There was no blemish of sin in Him, and no spot of sin on Him. To rob the air of its oxygen, and expect men to live is as foolish and hopeless as to rob the Gospel of these vital facts and expect men to be saved. 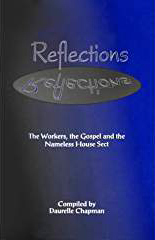 In the Cooneyites mission they evidently preach a different gospel, but which is not another, but one which is devoid of the very essentials of the Gospel, and against which, the Apostle utters the most solemn warning (see Gal. 1:6-9). Their harsh judgment and arrogant attitude towards others than themselves does not agree with the profession and boast of being in "the lowly way"; but rather proclaims their behaviour to be as unchristian as their teachings are anti-christian. We feel that it would be unfaithful as well as unkind if we did not warn our readers, and beseech them to beware of being beguiled by this plausible but seriously false teaching. The Apostle Paul warns of subtle and satanic forces that Satan would use for the accomplishment of his dark designs, and these Cooneyites seem to feature those he describes. "Satan himself is transformed into an angel of light. Therefore it is no great thing if his ministers also be transformed as the ministers of righteousness" (2 Cor. 11: 14). We have no other object in writing the foregoing than to warn the unwary, and seek to help some to "recover themselves out of the snare of the devil, who are taken captive by him at his will" (2 Timothy 2:26). If this should fall into the hands of any who know and feel that they are not right with God, but are anxious to be so, let us urge you to lose no time in taking your only true place before God as a confessed and repentant sinner, and put your full confiding trust in Christ the sinner’s only Saviour: "Neither is there salvation in any other: for there is none other name under heaven given among men, whereby we must be saved" (Acts 4:12). 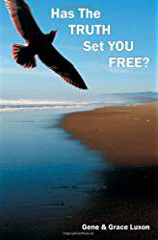 No alteration of your life for the future will either meet your need or God’s requirement in regard to your sins. Nothing but the sin-cleansing, precious blood of Christ will meet your case, and with all the earnestness and tender solicitude of which we are capable, we would urge you to flee at once from every bit of teaching, even if it is called gospel, that robs Christ of His deity, and His precious blood of its atoning value. Put your simple trust in Christ, "Believe on the Lord Jesus Christ, and thou shalt be saved" (Acts 16:31). "For God so loved the world that He gave His only begotten Son, that whosoever believeth in Him should not perish, but have everlasting life" (John 3:16).